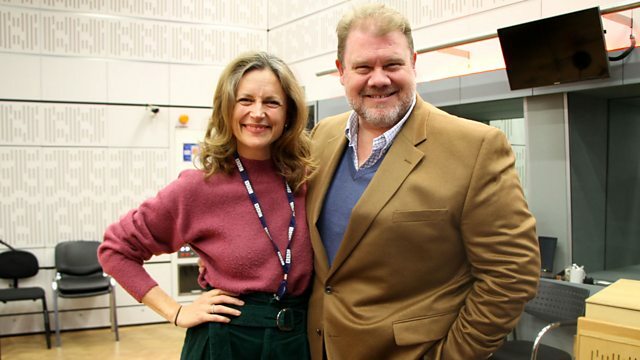 Katie Derham presents a lively mix of music, conversation and arts news. Martin Hayes and Iarla O'Lionaird perform live. Stuart Skelton speaks about the International Opera Awards. Katie Derham presents a lively mix of music, conversation and arts news. Her guests include the fiddle player Martin Hayes and his new quartet, as well as the singer Iarla O'Lionaird who all perform live in the studio ahead of their concert at the Barbican tomorrow which explores Irish life in England. Stuart Skelton joins us to perform and speak about the International Opera Awards. Performer: Ensemble Appassionato - Mathieu Herzog. Ensemble: Ensemble Appassionato. Conductor: Mathieu Herzog. Mozart les trois dernieres symphonies. Performer: Contrapunctus. Choir: Contrapunctus. Choir: Choir of Queen's College, Oxford. Director: Owen Rees. Gloria Tibi Trinitas - Music by John Tavener. Performer: Contrapunctus. Choir: Contrapunctus. Choir: Choir of The Queen's College, Oxford. Director: Owen Rees. Performer: Gautier Capuçon. Performer: Martha Argerich. Performer: Iarla Ó Lionáird. Ensemble: Martin Hayes Quartet. Conductor: Gottfried von der Goltz. Orchestra: Freiburg Baroque Orchestra. Performer: CBSO conducted by Edward Gardner. Orchestra: City of Birmingham Symphony Orchestra. Conductor: Edward Gardner. Performer: Stuart Skelton. Orchestra: West Australian Symphony Orchestra. Conductor: Asher Fisch. Performer: Stuart Skelton. Performer: Kelvin Lim. Performer: Lumen. Conductor: Benjamin Thiele-Long. BBC Radio 3 In Tune 25th January 2019.